A well-built brand consistently reflects what the brand stands for and the brand’s extraordinary promise of value. Nespresso has it all. And that is why we have identified Nespresso as one of the 2014 LOL Luxury Brands of the year! Nespresso knows its target market well: coffee aficionados, devotees, enthusiasts, fans, admirers and buffs. Nespresso appreciates their need for instant gratification, small indulgences and a hassle-free luxury lifestyle. This is exemplified in features such as a pre-heating time of just 15-20 seconds and Automatic Blend Recognition technology (bar codes on each capsule tell the machine which settings to use without user guesswork). From superior product design, functionality, packaging and brand design, to a superior user experience, to simply superior coffee taste, Nespresso is a brand you want to join and rave about to your friends. 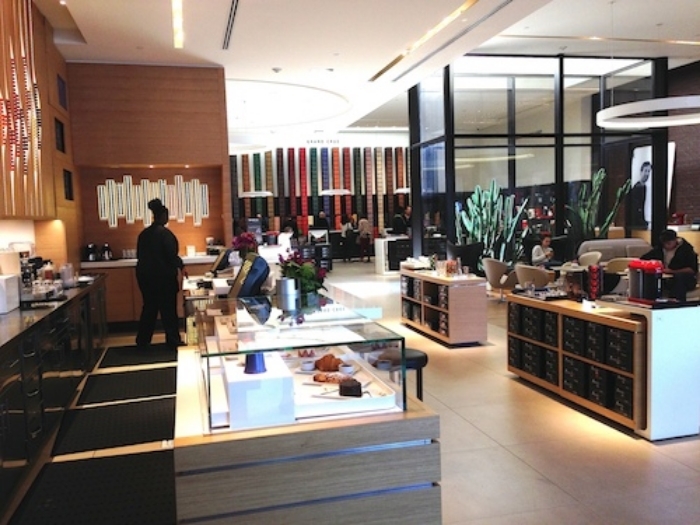 Shortly after we purchased our Virtuoline and experienced the difference first hand, we returned to the Nespresso store in Beverly Hills that finally opened. We were greeted at the front door by the equivalent of a Maitre D’ who asked if we wanted to be seated in the coffeehouse section of the store or were interested in exploring the product section.The entire staff was in uniforms reminiscent of an upscale European boutique. Visually the store’s architectural design is stunning and welcoming. It has a skylight above a wonderful cactus garden in the center and its storefront windows are totally open to the outdoor seating area. The service is superb in both sections! We were offered free espressos and a dark chocolate raspberry square in the product area. The place was packed with existing and potential customers when we were there. Nespresso is fluent in the language of luxury in every single facet of its brand. We applaud this company especially for being consistent from every perspective. As a luxury real estate marketing professional, let Nespresso be a touchstone that represents what it takes to have brand consistency. What are some ways in which you can express your own extraordinary promise of value consistently throughout the components of your personal brand?